Remember those cute little candy hearts with sayings that you usually buy by the sack full every Valentine’s Day? Well, sad news. 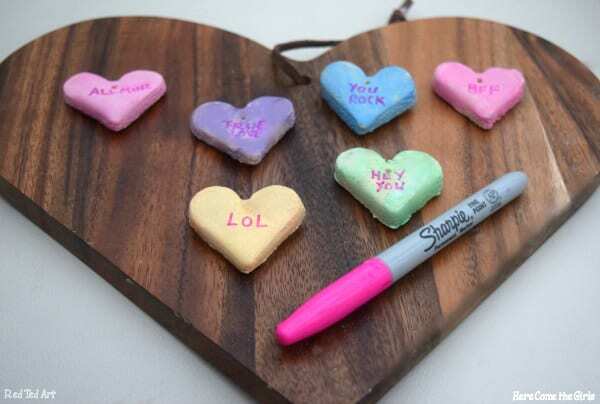 They’re in short supply in 2019 because Necco, the company that cranked out 8 billion “SweetHearts” every year, went out of business last summer. 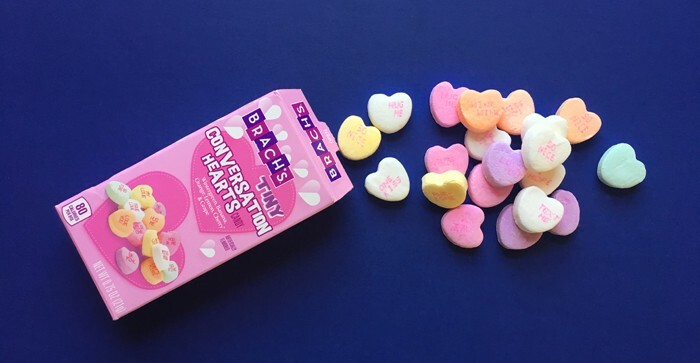 You might still be able to pick up some “conversation hearts” by Brach’s, but good luck getting your hands on them! I picked up a couple boxes at Dierbergs in January, but it looks like they’re all sold out now. The good news is that SweetHearts will be back next year! The brand was sold to Spangler Candy Company–the guys who make Dum Dums. Sadly, by the time they signed off on the deal it was too late to crank out candy hearts for this year. Yep, it took Necco 11 months to make all the SweetHearts we eagerly bought up for Valentine’s Day in about 6 weeks. How can we Replace SweetHearts? Now that I know we’ve been crunching on months old candy every Valentine’s Day, I understand why SweetHearts were more for reading than snacking! 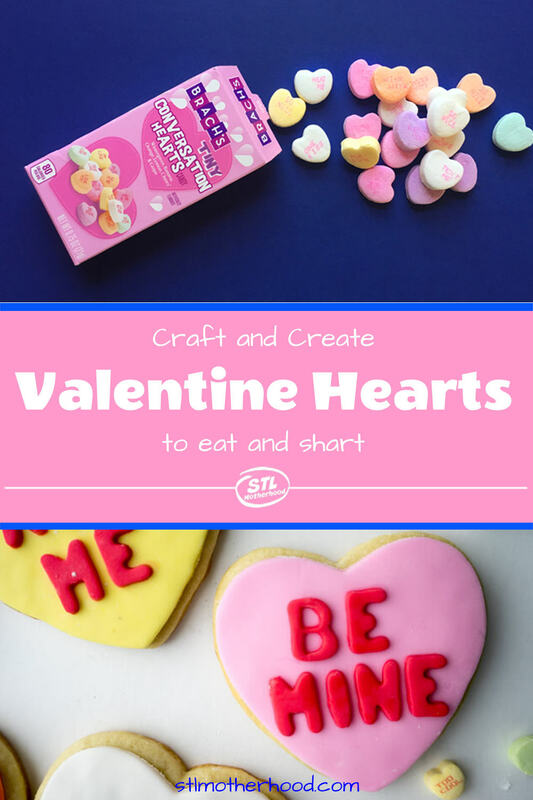 But never fear, I’ve scoured the web for some candy heart replacements–and with the exception of some very special Krispy Kremes, we can make all of these hearts at home. SweetHearts were always known for their silly Valentine sayings. The old Sweethearts had 80 phrases stamped into them with a printing plate–originally five letters on top, four on bottom. In the 90’s they decided to shake things up and replace some out of date phrases with 20 new sayings. The each year they’d update the mix to keep the tiny hearts on point with that year’s slang. 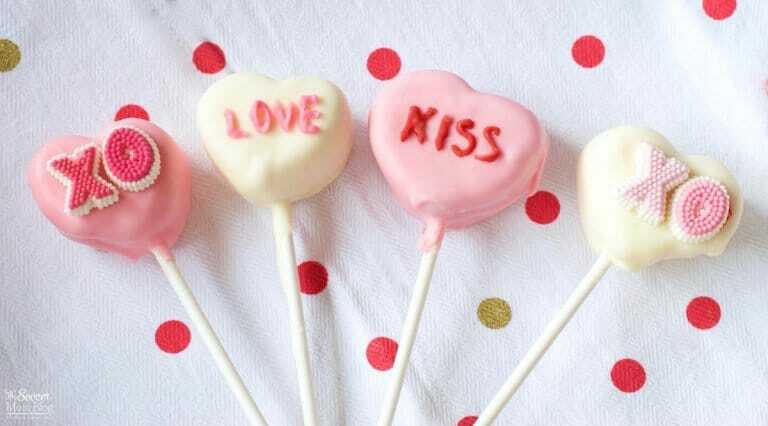 Some of the oldest phrases: BE MINE, KISS ME, SWEET TALK, LOVE YOU, and MARRY ME. Modern phrases include #LOVE, BEST DAY, BEST DAY, BE HAPPY, CRAZY 4 U, TEXT ME, and TWEET ME. MY TREAT, YUM YUM, CHILL OUT, GET MY DRIFT, COOL CAT, URA TIGER, DREAM TEAM, BE MY HERO, ALL STAR, DREAM, CHARM ME, VOGUE, DIVA, WHAT’S UP, URA QT, TOO SWEET, AMORE, 2000 HUGS, GIRL POWER, YOU ROCK, AS IF, 1-800 CUPID, WALK ON BY, YEAH RIGHT, FAX ME, PAGE ME, and COOL DUDE. Need some cool Valentines for the classroom? I gotcha covered! 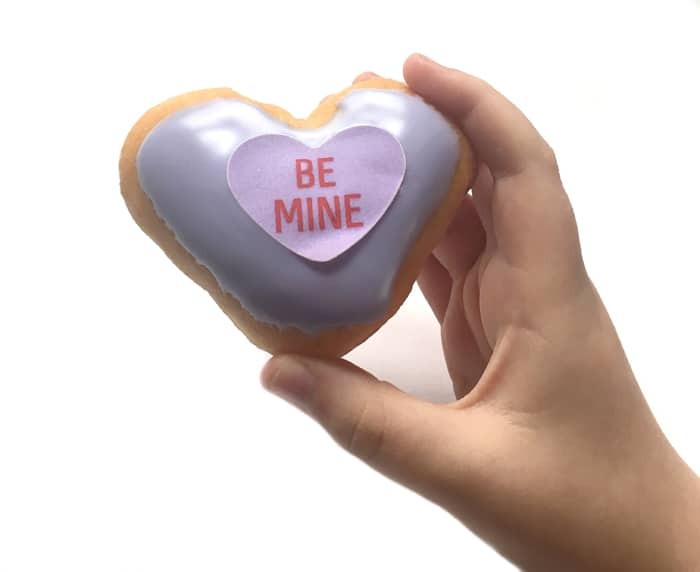 For a limited time, you can pick up Valentine heart shaped Krispy Kreme donuts, in four tasty flavors. 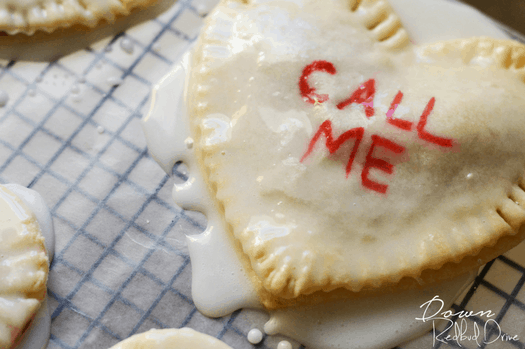 Or you can make delicious Conversation Heart Hand Pies for Valentine’s Day instead! They’re stuffed with raspberry filling, yum! Tip: You’ll need FOOD SAFE markers to write on your pie crust! These sugar cookies are not only really tasty but they are fun to make! 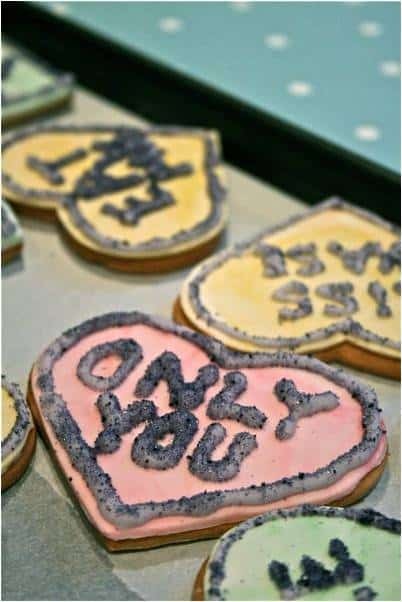 These use fondant and letter shaped cookie cutters. Tip: Find one-inch tall letter cookie cutters here. Tip: Stamp cookies with this food safe letter set! 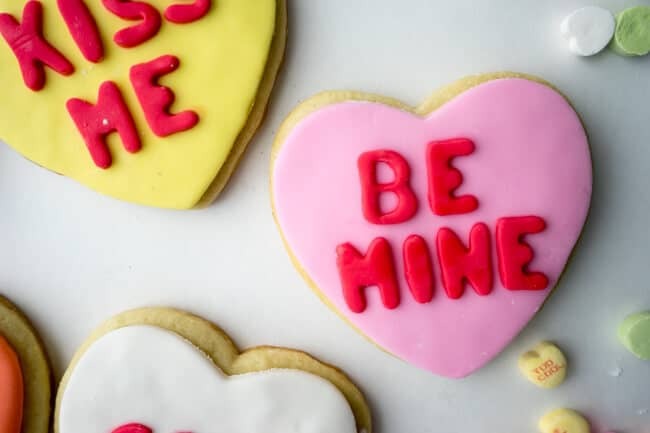 These butter cookies are covered in a layer of fondant and topped with icing words and sugar! 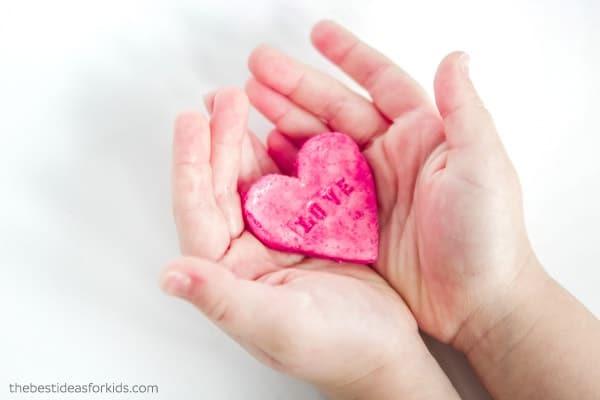 The perfect DIY Valentine gift your kids could make for a favorite teacher or grandparent! Tip: Jet-Puffed makes strawberry flavored “heartmallows” every February! 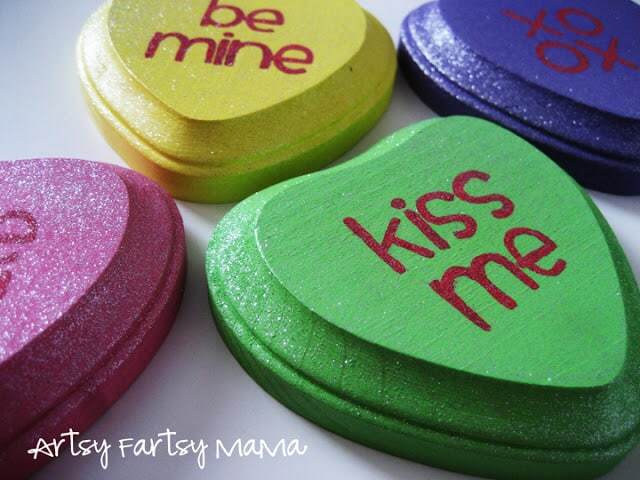 Gotta love these salt dough hearts because they look simply adorable and can be personalized to say whatever you want. 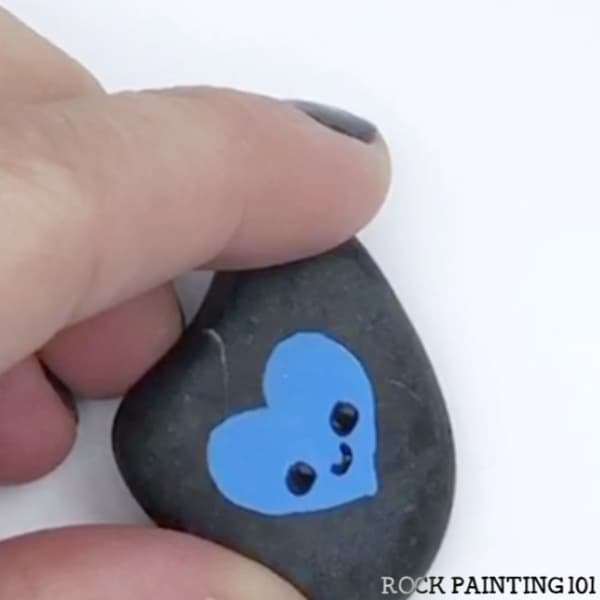 Sometimes you just need a super simple, yet totally cute, rock that you can whip up a bunch to hide around town. Tip: Pick up a sack of black river rocks at the craft store…or on Amazon. Here’s some cute sparkly wooden conversation hearts. Tip: If your craft store doesn’t have wooden hearts, try Amazon. Does a piñata make you think party time? 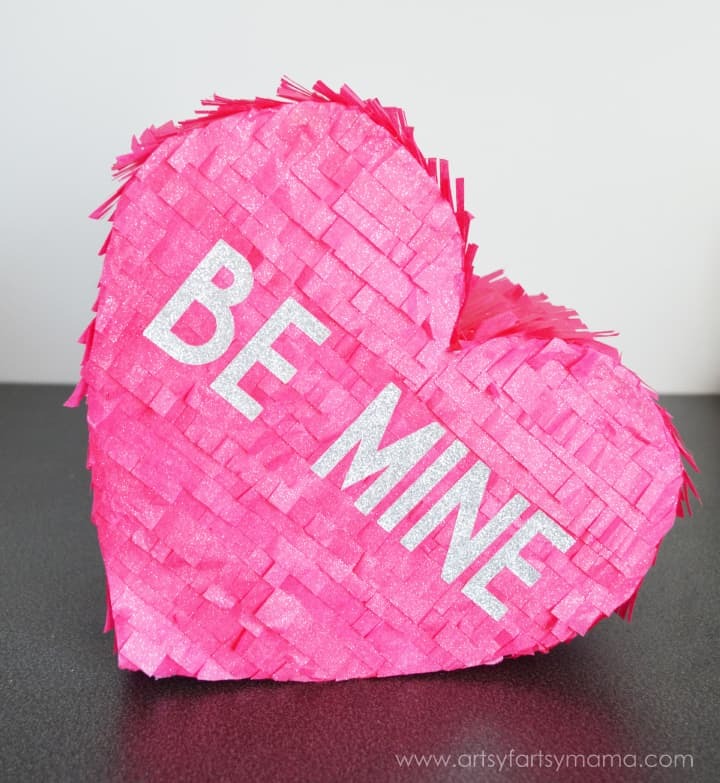 Here’s a decorative heart shaped piñata for Valentine’s Day. 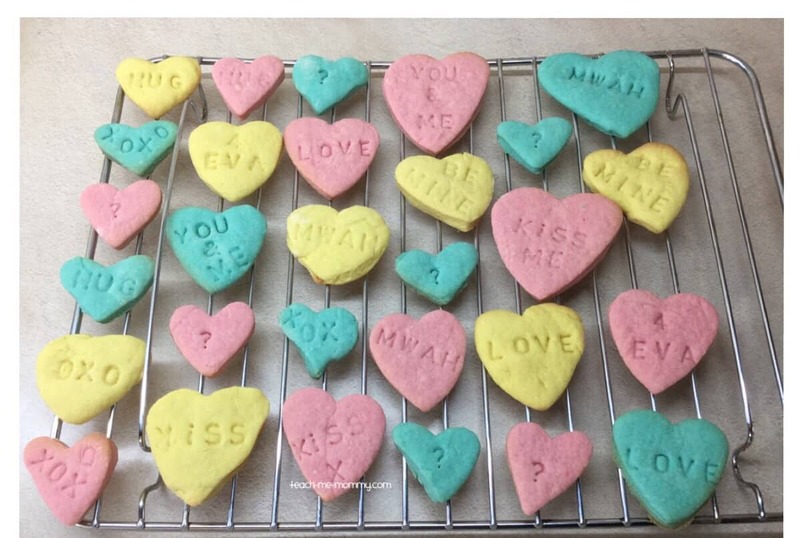 These conversation heart necklaces are made from salt dough, so leave some time to let it dry. Adorable and posable! You can make a whole squad of BFF heart figurines from wooden shapes and fuzzy sticks! Tip: Find wooden heart shapes here.